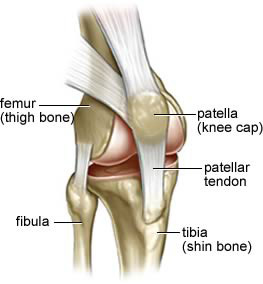 The patella, commonly known as the kneecap, is the lens-shaped sesamoid bone at the front of the knee. The patella is held in position by the lower end of the quadriceps muscle (the main muscle at the front of the thigh), and by the patellar tendon, which attaches it to the tibia (shin bone). Dislocation of the patella is usually due to a congenital (inherited) abnormality, such as an underdevelopment of the lower end of the femur (thigh bone) or excessive looseness of ligaments that support the knee. Should the patella be fractured as the result of a direct blow, it is broken into a number of small fragments. Since the bone lies within the quadriceps femoris tendon, little separation of the fragments takes place. Fracture of the patella due to indirect violence is caused by the sudden contraction of the quadriceps snapping the patella across the front of the femoral condyles. The knee is in the semiflexed position, and the fracture line is transverse. Separation of the fragments usually occurs. Inflammation and roughening of the undersurface of the patella, resulting in knee pain that worsens when bending the knee or climbing stairs, is caused by chondromalacia patellae in adolescence and by arthritis in adults. Reflex contraction of the quadriceps muscle so that the leg kicks, elicited in a patient sitting with one knee crossed over the other by sharply tapping the tendon of the muscle below the kneecap. The reflex is mediated through nerves emanating from the third and fourth lumbar spinal levels (see spinal nerve). This is a test of the connection between the sensory nerves attached to stretch receptors in the muscle, the spinal cord, and the motor neurons running from the cord to the thigh muscle, all of which are involved in the reflex. The patellar reflex is reduced or absent when there is disease or damage of the spinal cord at or below the level of the reflex and exaggerated in disorders above the level of the reflex.